This is about as messy as I can handle. I’m waaaay too crazy for this mess. 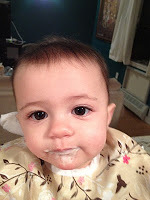 In theory, I want Eliana to experience food inside and out, to get to know the smell, feel and, duh, taste of her food and to become a “good eater.” I say, and do actually believe, all of that. 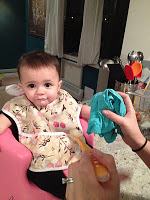 Until she tries to grab the food off the spoon, smear it all over her face, her hair, the bib, her clothes, me, her Bumbo seat and the counter. I swear that if it were not winter, I’d strip her down to her diaper, feed her outside and hose her down when she’s finished. Yes, I have considered doing all of this in the shower. Even I realize that’s a bit extreme. So what do I do? 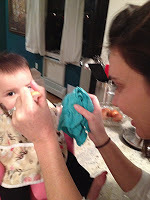 I hover over her with the spoon in one hand and a damp napkin in the other and swab that gorgeously dirty little face after every other bite. Poor thing tries to grab the spoon and my heart palpitates as I begin to worry about where the food on the spoon will end up. Do you believe my crazy Mommy? I know. I’ve got issues.